If you have questions about the Recovery options in Windows 8, see Microsoft’s How to restore, refresh, or reset your PC page. 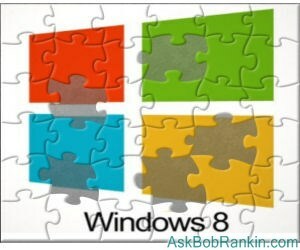 Most recent comments on "3 Ways to Repair Windows 8"
Best way to fix Winblows 8, go back to Windows 7 and wait for Windows 9. Windows 8 is Microsoft's version of "New Coke!" Medhod 5: Install some version of Linux (Ubuntu for a newbie, Linux Mint once you've tried Linux for a while). Once you've tried it for a while, you'll easily get to the point where you'll be ready to stay with linux. You can install linux and keep windows, too, if you'd prefer. I have used the reset to factory state and it works great, did it on a couple machines, thanks for a great article. So, to repeat ... Windows 8 Refresh will delete any desktop programs you installed, including Microsoft Office if you bought that. I hope you saved your product key! Your Metro aps from the Microsoft store will be saved in a Refresh. I laughed out loud to your comment and it is definitely On POINT! don't believe the hype. i tried to use all of these steps and windows couldn't open any of them so i had to go thru F12 to get pass it and into the points you explained, so everything isn't black and white here.